The first tomatoes are being harvested from our garden, and basil is flourishing at our local CSA. This recipe is all about the fresh ingredients and we love to put them to good use. It may be simple, but it is quite appealing and just perfect for any get together. 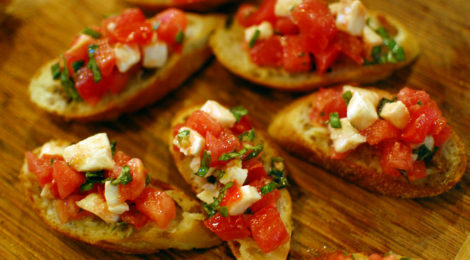 What is your favorite bruschetta recipe? Turn on your grill or griddle to about 400° and let preheat. Combine tomatoes, basil, mozzarella, salt, and pepper in a medium sized bowl. Drizzle to coat with olive oil. Slice your baguette diagonally into 1/2 inch thick toasts. Brush both sides with olive oil. Place toasts onto grill or griddle and let crisp, about 5 minutes on each side until slight grill marks show; flip and repeat (this step can be done in a 350° oven as well). Top bread with bruschetta mixture, drizzle with balsamic if desired and serve.